Mini SMP adapters use the minismp interface, a scaled down version of the smp (70% smaller), and is compatible with gppo & ssmp. MiniSMP to SMA adapters and MiniSMP to MiniSMP adapters are featured here, the sma limiting performance to 27ghz; other versions of sma to minismp adapters will be offered later. The male SMP comes in with vaious Detente options, which determine mating/unmating force; full detente & smooth bore. 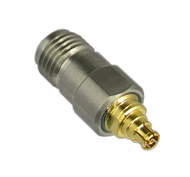 These Coaxial Mini-SMP to SMA adapters feature stainless steel & BeCu construction. 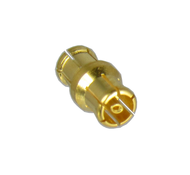 Please click on a subcategory from the drop down menu above to find the exact minismp rf & microwave adapter you need.